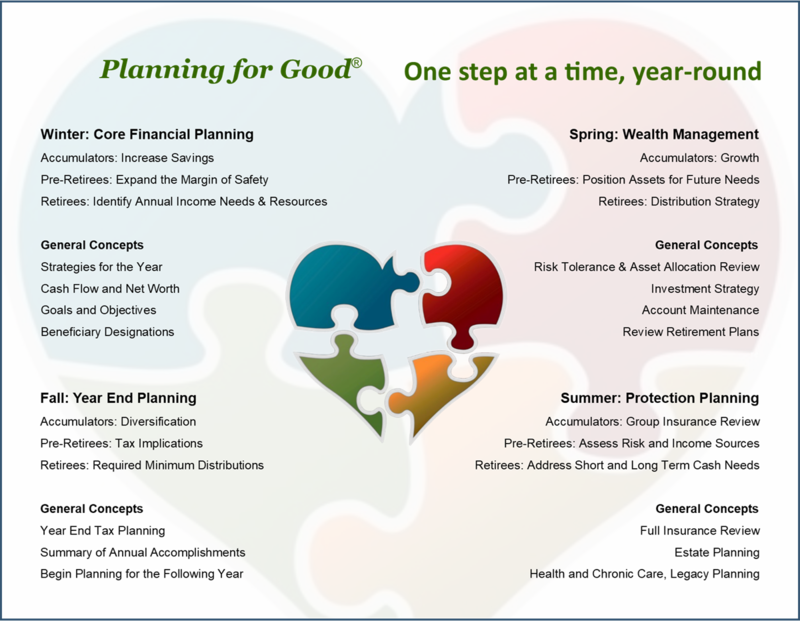 Planning for Good® is how we do business; we “put your money where your heart is.” Our goal is to help our clients focus on the good things, now and in their futures. Our team does that through financial planning and by implementing strategies that keep your personal values in mind. We believe in the importance of giving back to our communities. Helping to raise money for non-profit organizations and charitable causes is integral to my practice. If you are involved with a community organization and are looking for our support, please contact us. We Plan for Good for you, too! At the bottom of this page you will find our Annual Review Process. This is simply a framework on the topics we try to touch upon with our clients each quarter. Our goal is to ensure that we are helping to keep you on track with the things that matter to you most. Our Planning for Good® team is proud to have raised over $20,000 for charity over the last five years. Take a look at some of the causes that we support.